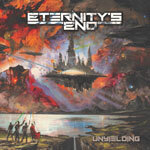 Eternity's End are a power/speed metal band from Germany formed in 2014 by guitarist and songwriter Christian Muenzner. The bands debut album 'The Fire Within' was released in 2016. Proceeding to record a second album, Eternity's End recruited a second guitarist, becoming a six piece outfit. The new album 'Unyielding' harks back to the glorious days of power metal evolution with bands such as Helloween, Running Wild and Gamma Ray, with screeching guitars, screaming vocals and fast paced foot on the monitor style catchy sing a long able choruses. 'Unyielding' is a barn storming and furiously aggressive rampage of high velocity power/speed metal. The duel guitar attack is savage, as Eternity's End rocket through ten songs in fifty one minutes, hitting the ground in full flight with 'Into Timeless Realms'. Phenomenal pace hits very hard as 'Into Timeless Realms' screams along at high velocity, invoking vigorous head banging from the moment it begins. The power metal scene in Germany has been a stronghold since the early eighties and with the likes of Eternity's End, will continue to be for many years to come. 'Into Timeless Realms' is one of the best opening songs off an album I have heard for ages, pricking the ears up, raising the hairs on the arms, sending a tingle down the spine and pumping adrenaline like it's going out of fashion. The breathless opening doesn't relent either as 'Cyclopean Force' takes off with the energy and urgency of a jet fighter off to war. Heavier than 'Into Timeless Realms', 'Cyclopean Force' is a typhoon fuelled rampage of devastation, that will leave you gasping for breath. As a teenager growing up during the eighties power metal explosion, this is an offering that has gone straight for my heart, and after only two songs, am already in love with it. The title song 'Unyielding' drops a gear and marches on at a mid tempo heavy rock pace. Majestic and anthemic in style as it strides forward, 'Unyielding' stands astride the borders of the hard rock, heavy metal and power metal genres. Gloriously fast paced heavy metal takes the album to the next level of brilliance, with the outstanding 'Blood Brothers (The Oath)'. The fierce aggressiveness delivered throughout 'Blood Brothers (The Oath)' keeps the pace very high, with heads banging hard everywhere, neck muscles stretching to new limits, as fans of high velocity power metal all around the world raise their fists high and punch the air in sheer delight. What a song... 'Dreaming Of Cimmerian Shadows' brings a touch of the symphonic metal genre to the album, with prominent keyboards and sublime guitar solos keeping the listeners attention fully hooked. Oh, and maybe I should mention too that 'Dreaming Of Cimmerian Shadows' is an instrumental. With its mellow intro, 'Horizonless' gives off the impression of impending balladry, building to a climactic crescendo as, yes, here comes the obligatory modern day power metal album ballad inclusion. Although heavy and somewhat a little moody and dark, 'Horizonless' is a majestic march of heaviness, keeping just half a step away from planting both feet in ballad territory. Blistering speed returns to the album in emphatic style with 'Under Crimson Moonlight'. High velocity and highly energetic, 'Under Crimson Moonlight' screams on by at a speed that may just outrun the Japanese bullet train. With a title that sounds like it should belong on a death metal album, 'Necromantic Worship' is a furiously fast paced, lightning quick, heavy metal masterpiece. Keyboards, guitars and vocals all scream and screech as 'Necromantic Worship' scorches by at break neck speed, leaving burn marks in the ground. A devastating combination of power and speed, is quickly followed by 'Triumphant Ascent'. With hints at the sound of fellow countrymen Running Wild, 'Triumphant Ascent' is melodic power metal at its finest. Catchy and infectious with a sing a long able chorus, 'Triumphant Ascent' stands tall in the glory and epic sub genres of the power metal genre. Bringing the album to a close is the six minute epic 'Beyond The Gates Of Salvation'. An aggressive barrage of heavy hitting heavy metal, 'Beyond The Gates Of Salvation' is fast paced, foot on the monitor style power metal at its finest, and is a glorious end to a glorious album. Overall, fast paced and furious power metal, Eternity's End deliver an infectious and catchy album of head banging addictiveness.